Warrior Mist™ is the most effective formula for pain relief offered by HPDI. Warrior Mist is an all-natural, fast-acting, topical pain reliever that is effective for many types of pain. I should know. I have used it nearly every day—for years! Types of pain Warrior Mist is known to stop, reduce, or soothe include: back pain (including sciatica), knee pain, carpal tunnel syndrome, headaches (including migraines), neck pain and tension, stiff and painful (or pulled) muscles, plantar fascitis, arthritis, sports injuries, old injuries, sprains and strains, bruises (including deep bruises), shin splints, tennis elbow, nerve pain, and post surgery pain. Practicing aikido for years, I have a frequent need for the rapid effects of Warrior Mist. Having used it for regularly for a long time, I appreciate how quickly it relieves pain like joint pain or sprains. It also works spectacularly for bruises, cuts, abrasions, burns, bug bites, and many other applications. Warrior Mist comes in a convenient one-ounce spray bottle. I shake the bottle and then add a few pumps—or as many as I need—to my non-pumping hand and rub onto the affected area. You can also spray it directly onto skin before rubbing it in with a clean hand. If you need more, you can always unscrew the cap and pour directly into your hand or onto skin, but I usually only reserve this action for times when I’m at the end of the bottle and I want to use all the Warrior Mist remaining in the bottle. The small bottle travels well, and I usually take it with me whenever I travel. I also keep a bottle ready in a small hiking kit that I carry with me on the trail. While I may not always need it, nevertheless it is there. I cannot count how often I used it when I’ve least expected to need it. Sprained ankles or swollen fingers heal a lot faster than you might expect, compared to not having Warrior Mist around. It even works well on things like mosquito bites—and helps repel them. Warrior Mist can be combined effectively with other natural topical products, especially Ancient Minerals Magnesium Oil (see video). I often mix a little Warrior Mist with Magnesium Oil in my palm. This mix gives me all the benefits of Warrior Mist with the added boost of extra magnesium chloride that speeds healing. • LONG LASTING – pain relief last eight hours (or more) per use. This is a natural formula, so you will eventually need to re-apply it. But fewer applications means more time living life pain free. • SAFE – 100% natural formula. This means that unlike prescription drugs or many over-the-counter medicines, there are no harsh or dangerous side effects. • RAPID HEALING. Not only effectively relieves pain, but also supports rapid healing at the cellular level. It thereby supports healing at the sources of pain. i.e., helps with the underlying causes of pain. • REDUCES MUSCLE SORENESS AND TENSION. Another benefit of direct topical application of natural, yet powerful (mostly herbal) ingredients. While this has obvious benefits for athletes, it also helps weekend warriors, or anyone who has muscle soreness due to any reason! • INCREASES CIRCULATION. Increased circulation is a significant healthy benefit in itself, allowing better oxygenation of tissues, supporting healing, reducing stagnation of blood, and boosting processes of detoxification. • LESSENS INFLAMMATION. Inflamatory processes can be harmful to the body. Warrior Mist helps reduce inflammation naturally, and thereby lessens free-radical damage from it, for example. This significantly supports your healing process. • TISSUE REPAIR. When the ingredients in Warrior Mist penetrate tissues, then those tissues can begin the process of healing and repair, and do it faster! • HEALS SKIN IRRITATIONS. A major added benefit is the healing of “minor” skin irritations, cuts, abrasions, etc. This is because the ingredients in Warrior Mist™ do double duty as superb nutrients for the skin. • SCAR REDUCTION. Warrior Mist™ can soften scar tissues and stimulate the kind of deep healing that results in smaller scars and improved appearance of scars. WHY IS WARRIOR MIST EFFECTIVE? Warrior Mist™ is a revolutionary skin, muscle, and joint support formula that uses DMSO, olive oil, coconut oil, and water as base (or carrier) ingredients that transdermally transport the other ingredients directly to the site of the problem where they work together harmoniously and effectively. Functional ingredients carried to the site of pain include: peppermint oil (the primary source of menthol in the product), magnesium chloride, MSM, lemon oil, and lavender oil. Each of the functional ingredients (and their amounts) were carefully selected for their ability to stop pain, to help the body overcome the causes of pain, to promote healing at the local level, or to work synergistically with the other ingredients. Warrior Mist is 100% all-natural and totally safe! As a topical analgesic, Warrior Mist conforms to the proposed rules set forth in FDA Monograph 348. The label used on the current Warrior Mist (1 oz spray bottle) meets the requirements set forth in this monograph. Even though there are a number of ingredients in Warrior Mist that can potentially provide temporary pain relief, the FDA monograph only recognizes the ingredient menthol, the major ingredient in peppermint oil, as an allowable active ingredient. According to the monograph, we can only mention menthol as the active ingredient and all other ingredients must be labelled as inactive ingredients. The truth is that all the ingredients (functional and base/carrier ingredients) add up to a synergistic formula that rapidly relieves pain in a single, easy-to-apply topical product. What more could you ask for? WHAT INGREDIENTS DOES WARRIOR MIST CONTAIN? COMPOSITION / INGREDIENTS: DMSO (99.999% pure), peppermint oil, organic olive oil, distilled water, MSM, magnesium chloride, lemon oil, lavender oil, and organic coconut oil. Dimethyl sulfoxide (DMSO), a by-product of the wood industry, has been in use as a commercial solvent since 1953. Furthermore, in 125 countries throughout the world doctors prescribe it for a variety of issues, including inflammation. DMSO has been used widely as a carrier in topical analgesic formulas. Laboratory studies have shown that DMSO is able to block peripheral nerve C fibers. Burns, cuts, and sprains have been treated with DMSO. Relief is reported to be almost immediate, lasting up to 6 hours. DMSO reduces inflammation by several mechanisms. It is an antioxidant, a scavenger of the free radicals that gather at the site of injury. 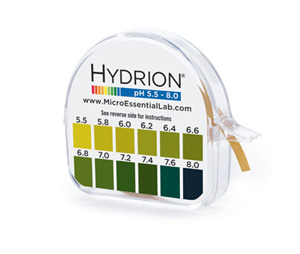 Studies have shown DMSO to be one of the safest ingredients known with a toxicity similar to that of water. DMSO has long been used to promote healing both in animals and humans. Those who have used it for minor cuts and burns report that recovery is speedy. Several studies have documented DMSO use with soft tissue damage, local tissue death, skin ulcers, and burns. Applied topically and repeatedly, DMSO flattens the raised, nodular, lobed liner mass of scar tissue in keloids and acne. MSM is a naturally occurring nutrient found in normal human diets. In the body DMSO and MSM, which form each other, are indistinguishable in their biochemical effects. They reach a equilibrium distribution between them that is dependent on the local body chemistry, and is independent of which one you start with. The metabolic enhancement mechanism of MSM and DMSO is that of an exceptionally effective oxygen transport system. This system is made particularly effective by the feature that both DMSO and MSM are highly soluble in both oil and water. MSM makes cell walls permeable, allowing water and nutrients to freely flow into cells and allowing wastes and toxins to properly flow out. The body uses MSM along with Vitamin C to create new healthy cells, and MSM provides the flexible bond between the cells. Without proper levels of MSM, our bodies are unable to build healthy cells, and this leads to problems such as lost flexibility, scar tissue, wrinkles, varicose veins, hardened arteries, damaged lung tissues, dry cracking skin, digestive disorders, joint problems, and inability to defend against allergic reactions to food, animals and plants. The primary constituent of peppermint oil is menthol, which causes a physical reaction when inhaled or applied to the skin. Menthol produces an immediate and pronounced sensation of coolness that effects the body quite noticeably, and creates a “warming effect” as blood flows into the area of application. Peppermint oil can be used externally for providing relief from pain. Peppermint oil increases your immunity. It also improves blood circulation. Additional of the uses of peppermint oil include:acne, asthma, colds, cramps, dermatitis, exhaustion, influenza, headache, insect bites, mental fatigue, migraine, nausea, nerve pain, neuralgia, poor circulation, and respiratory disorders. Lavender oil helps in treating migraines, headaches, anxiety, depression, nervous tension and emotional stress. The refreshing aroma removes nervous exhaustion and restlessness and increases mental activity. Because it induces sleep, it is often recommended for insomnia. Lavender oil is also an excellent remedy for various types of pains including those caused by sore muscles, tense muscles, muscular aches, rheumatism, sprains, backache,and lumbago. A regular massage with lavender oil can provide relief from pain in the joints. Lemon oil is powerfully astringent and antiseptic. Lemon oil is detoxifying and is therefore good for blemishes associated with oily skin. Lemon oil is a powerful antioxidant and is a tonic for supporting the nervous and sympathetic nervous system. It’s been long known that lemon oil is anti-infective, antibacterial (especially with spores), and antiviral. It can function as a disinfectant and exerts vitamin P-like action for improving microcirculation, promotes white blood cell formation, and improves immune function. It has also been widely used in skin care to cleanse skin and reduce wrinkles. Magnesium chloride applied to the skin is an effective means for increasing magnesium levels in the body, and is particularly useful for relieving sore muscles and joints, and reducing pain related to functional magnesium deficiency. It is also proven for use in helping to calm “nerves” and reduce systemic bodily stress. Because the magnesium targets muscle tissues, it is thereby especially useful for replenishing depleted soft tissues and helping restore proper function. Magnesium is necessary for the production of energy in the body. When the body receives adequate amounts of magnesium, it can produce the levels of energy required to sustain the body and enable it to thrive. Magnesium chloride is proven for use in a variety of general applications, including bruises, cramps, muscle tension, and migraine headaches. Used as a base and mixed with other essential oils, olive oil makes a wonderful oil for skin health. In fact, it has been touted as one of the oldest healing and beauty techniques. A biblical reference from about 493 BCE documents the daily massage with olive oil and other oils as a part of the beauty regimen. DIRECTIONS: Shake bottle before applying. Wash hands before and after use. Apply in a thin layer to a clean, dry, and lotion-free area needing support. Shave thick hair that may prevent absorption by the skin. Gently massage the area of application to assist absorption. Reapply as needed 3–4 times daily. Contains DMSO, a known solvent. Use on people or pets at your own discretion. USES: Warrior Mist™ is an all-natural skin, muscle, and joint support formula. WARNINGS: For external use only. May cause temporary (up to 45 minutes) skin irritation, heating, or flushing upon use. Discontinue use if temporary skin conditions persist. Do not use on wounds or severely damaged skin. Do not bandage tightly. Avoid contact with eyes. Flush eyes with cool water if exposed. Do not use if allergic to any ingredients. Stop use and visit a health care professional if reason for use continues for more than one week. If swallowed get medical help or call a Poison Control Center. Consult a health care professional before use if pregnant. Warrior Mist topical formula is highly effective for pain relief. A major advantage is that it is a natural formula (available without a prescription) and can safely be re-applied whenever necessary. Another benefit is that it lacks the side effects common to prescription pain medications. Try Warrior Mist for yourself. If you’re like me, you will want to keep a bottle or two ready for the aches and pains of daily life. Use it as often as you need it. Be a warrior! I am excited this month to talk about Warrior Mist, which is an all-natural skin, muscle, and joint support formula. Warrior Mist is a topical formula that is my go-to-product for effective pain relief. Warrior Mist is highly effective for pain. Indeed, my father Dr. Hank Liers formulated it for rapid pain relief, naturally. Many health care professionals find it useful for their clients. Being applied topically on skin, Warrior Mist acts quickly at the pain source to stop it. Topical application is an advantage when it comes to rapid relief. 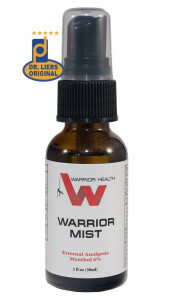 Warrior Mist comes in a pump-spray glass bottle. Beyond its effectiveness against pain, what I like about Warrior Mist is that it contains all-natural ingredients. What does that mean? Most of its ingredients are herbal like peppermint oil, lavender oil, and organic coconut and olive oils. Warrior Mist contains: DMSO (99.999% pure), peppermint oil (the source of menthol in the product), organic olive oil, distilled water, MSM, magnesium chloride, lemon oil, lavender oil, and organic coconut oil. Warrior Mist contains no harsh chemicals or synthetic preservatives (like parabens, dimethicone, or phenoxyethanol). 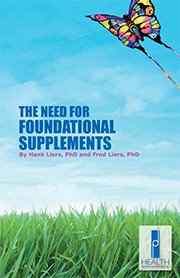 What else would you expect from a formulator like Dr. Hank Liers or a company like Health Products Distributors? For anyone who cares about NOT putting toxic chemicals on their skin, Warrior Mist is a high-purity formula worthy of consideration. It is a pure, simple, and effective formula. Warrior Mist comes in a spray bottle made of glass, not plastic. Shake it, then spray it. Gently massage the area of application to assist absorption. That’s all there is to it. 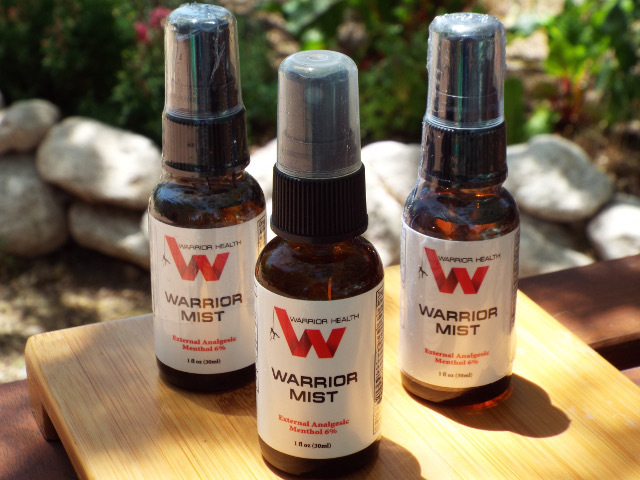 Warrior Mist is effective for many applications, including pain relief for joints (wrists, elbows, knees, ankles), bruises and scratches, as well as insect bites and skin irritations. I occasionally I spray it directly into my mouth for throat relief, especially in winter or during allergy season (although technically it is not for internal use). I practice aikido, which can stress joints, especially wrists. Most aikido techniques involve grips that can become throws. There are also strikes, counterstrikes, blocks, falls, rolls, wrist breaks (escapes), and other movements. Aikido is safe when practiced carefully. Yet, many techniques can lead to bumps, bruises, strains, sprains, and soreness. Warrior Mist helps me (and others) a lot. In fact, I donated a bottle of Warrior Mist to the dojo, so it’s there for anyone who needs it. I am not sure what I would do for routine aches and pains without Warrior Mist. Sometimes just having relief after an aikido workout makes a big difference in my day. My eight-year-old son also practices aikido in the same dojo. I feel confident using Warrior Mist on him because it is a safe, natural product that works. I also practice yoga. Yoga rarely results in the types of minor injuries I experience from aikido. 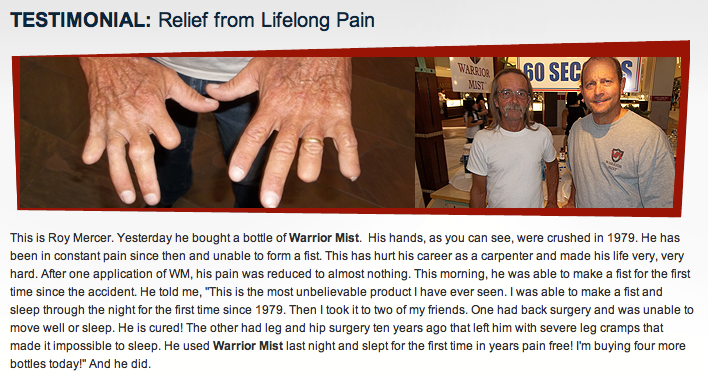 Yet, for times when I overstretch a muscle or overdo a pose, I reach for Warrior Mist for rapid, effective pain relief. I enjoy hiking. We live on the edge of a desert wilderness north of Tucson, Arizona. There are cactus, thick brush, thorny bushes, and biting insects like ants and scorpions. Many hikes involve at least a few thorns, scrapes, or mild soreness. Warrior Mist helps with these. 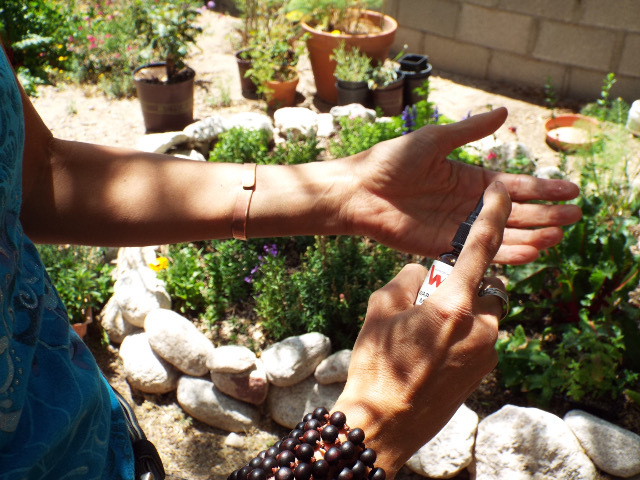 I have used Warrior Mist for bee and scorpion stings, ant bites, scrapes, cuts, small puncture wounds (e.g., from cactus spines), as well as skin irritations of various kinds. In fact, there are few types of pain I have found Warrior Mist doesn’t mitigate. I use it for shoulder pain, neck pain, and lower back pain when it occurs. I notice the sooner I get Warrior Mist on the affected area, the faster I experience relief. I don’t personally suffer from headaches, but friends who do tell me Warrior Mist helps them a lot. One of the ingredients is magnesium chloride, which is known to help ease headaches, including migraine headaches. Gently rub Warrior Mist around temples, forehead, or base of the neck. Pain relief is not always immediate when using Warrior Mist. Yet, I know from experience how much it helps. The ingredients it contains support healing, too. Be patient, give it time, and allow it to work. That is exactly what I do sometimes. Warrior Mist is ideal to keep in the house for everyday bumps and bruises like stubbed toes, bruised shins, or skinned knees. We find it useful after yardwork or gardening. You can spray it directly on an area, or else spray it into your hand first (after shaking the bottle), and then rub it into an affected area. I know of two people who use Warrior Mist for pain in the tailbone (coccyx), the final segment of the vertebral column. Tailbone pain for them was originally caused by falling. One person fell from a horse and the other off a skateboard. 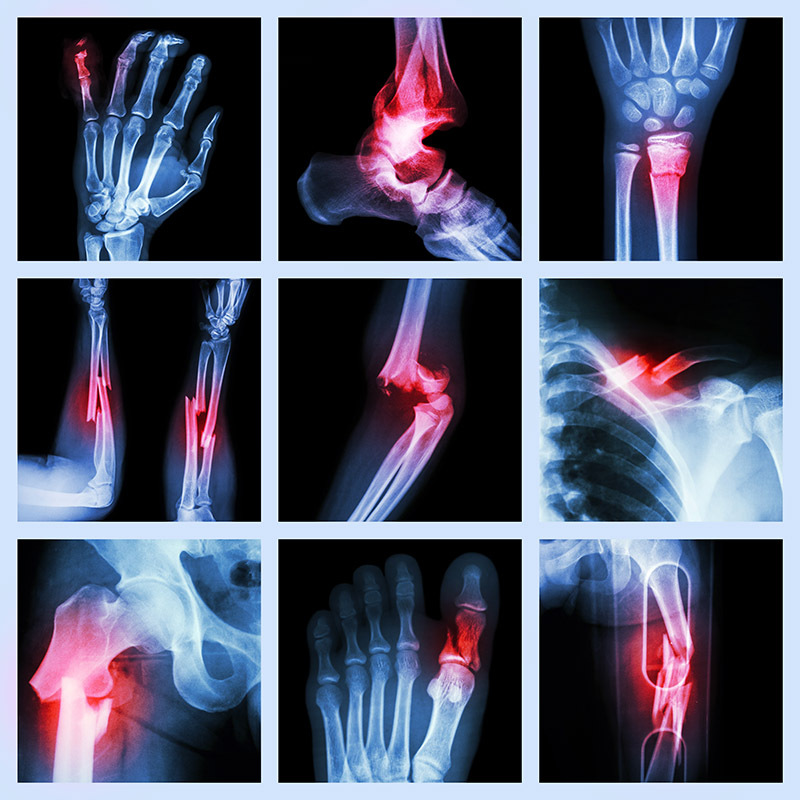 While these injuries are structural, Warrior Mist provides significant relief. The reduction in pain helps daily function and facilitates sleep. Warrior Mist is safe for use with pets. In fact, it was originally formulated for pets with the help of a veterinarian. You can feel confident using Warrior Mist on pets, large and small. It is ideal for use on dogs, cats, horses, and farm animals. Many veterinarians use Warrior Mist in their clinics for effective pain relief. If you are a veterinarian, consider using Warrior Mist for your pet patients. My wife Stefanie is a practicing acupuncturist. She uses and recommends Warrior Mist for her clients. She frequently uses Warrior Mist in her practice for knee pain, shoulder pain, and back pain. What she often does is mix about five sprays (pumps) of Warrior Mist with about ten sprays of Magnesium Oil along with a dime-sized amount of carrier oil (like organic jojoba oil or coconut oil) in her palm. She mixes the liquids in her palm (for amounts up to one tablespoon), but it can be mixed and stored a small container. For greater amounts, the ratios remain the same – about 2:1 Magnesium Oil to Warrior Mist – with correspondingly higher amounts of carrier oil. This is an excellent mixture because it combines the benefits of Warrior Mist and Magnesium Oil. There is a slight chemical reaction that occurs when Warrior Mist mixes with Magnesium Oil. It is actually a warming effect. Stefanie likes it because the mixture is then applied warm, which relaxes muscles and opens pores for better absorption. No “warm up” is necessary and clients seem to appreciate the mixture’s warmth. The mixture (of Warrior Mist, Magnesium Oil, and carrier oil) may be applied directly on affected areas with high rates of success. Clients themselves can obtain Warrior Mist and Magnesium Oil to make this mixture at home. Using a carrier oil is helpful, but not required because Warrior Mist contains organic coconut and olive oils. 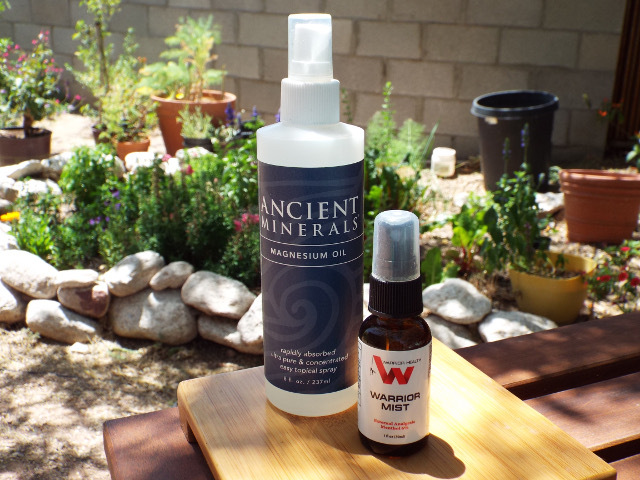 Warrior Mist works well mixed with Ancient Minerals magnesium oil. Stefanie also finds Warrior Mist useful for clients suffering from headaches. In addition, she will apply straight Warrior Mist to the throat, lymph nodes, or upper chest area for clients dealing with respiratory issues. Indeed, she applies it to these areas on herself when she feels she may be fighting or coming down with something. Use Warrior Mist on clean, dry, lotion-free skin. The DMSO in the formula acts as a solvent carrying substances on skin into the body. This allows natural ingredients in the formula to penetrate into painful areas. Wash hands and the application area (or wipe with a damp cloth) before treatment. Avoid using carrier oils with toxic ingredients (like synthetic preservatives) that could be pulled into the body. Stefanie tells her clients not to put anything on their skin that they would not eat. That is, use only natural oils and products containing ingredients that are natural and organic. A useful resource to determine what products are most natural is the Skin Deep Database on the Environmental Working Group website (www.ewg.org). If you are a health care professional who deals with clients requiring pain relief, please contact HPDI to request a sample bottle of Warrior Mist. See how well this effective pain relief formula works for your clients. Wash hands, shake bottle, then spray on clean, dry skin. Massage area to assist absorption. One group of people who love Warrior Mist is athletes, especially runners, triathletes, and other endurance athletes. Warrior Mist is useful for nearly all sports, including contact sports. HPDI’s sponsored athlete, pro cyclist Irena Ossola, uses Warrior Mist regularly, especially during races and high-intensity training. She incorporates it into the sports massage she receives with reportedly good effects. She also states that it helps her with recovery. Irena occasionally crashes her bicycle. This remains a hazard in her sport, she says. However, Warrior Mist has done much to help her joints, road rash and other abrasions, sore muscles, and to speed her recovery. For purposes of athletes, the magnesium chloride in Warrior Mist can help support muscle health and recovery, and provide effective pain relief. Dr. Hank Liers designed Warrior Mist as a natural formula containing ingredients known for providing effective pain relief. 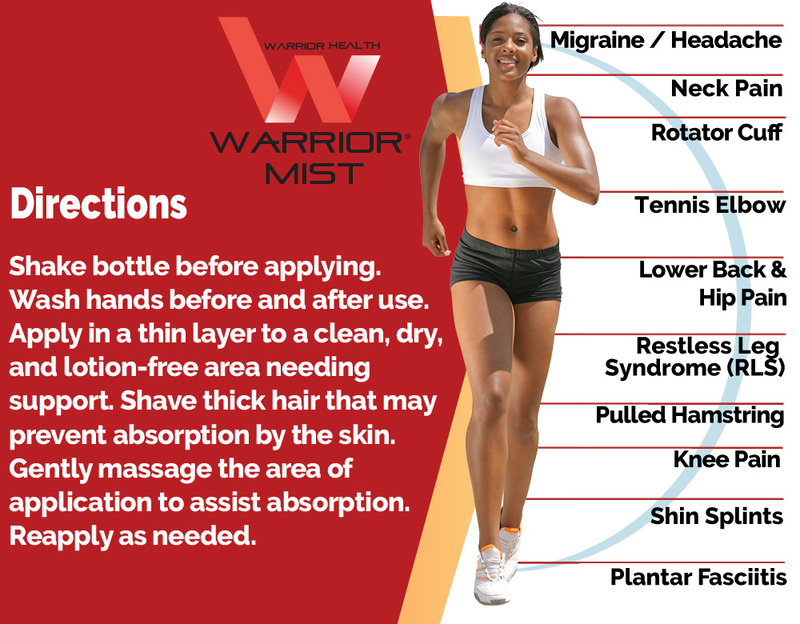 Given its wide applicability, topical application, natural ingredients, and proven history of use, Warrior Mist is ideal for personal use by consumers and in clinical settings for clients who require effective pain relief. Warrior Mist is one of the most natural, effective pain relief products available to heath care professionals and consumers alike. 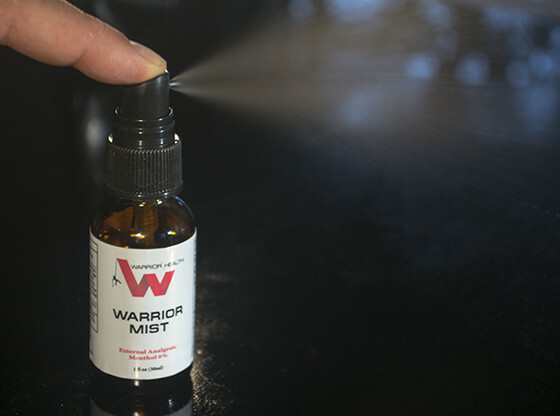 Warrior Mist comes in a 30 ml (1 oz) spray bottle which provides hundreds of applications. A single bottle typically lasts about two months. 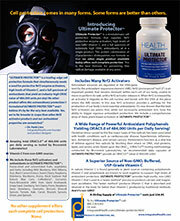 Warrior Mist is one of three Warrior Health products offered by Health Products Distributors. 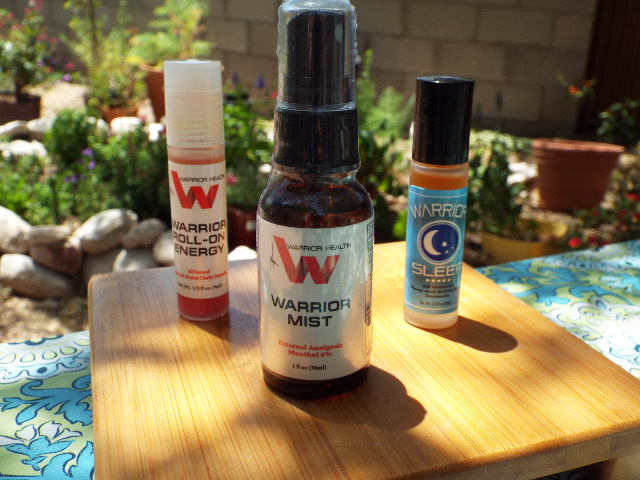 Dr. Hank Liers formulated these Warrior products, all of which are topicals requiring ultra-low doses (ULD) by design: Warrior Mist, Warrior Sleep, and Warrior Energy. Warrior Mist, Warrior Sleep, and Warrior Roll-On Energy are topical formulas. Warrior Sleep (9 ml) is an effective, natural sleep and relaxation formula having no drug-like side effects (compared to conventional sleep aids). Like Warrior Mist, you apply Warrior Sleep directly to skin (transdermal application) for rapid absorption. Warrior Sleep incorporates four natural ingredients for sleep: lavender oil, roman chamomile, magnesium, and melatonin. It uses DMSO and natural oils to carry these rest promoters into the body. Warrior Sleep contains: DMSO (99.999% pure), olive oil, distilled water, MSM, magnesium oil, lavender oil, lecithin, roman chamomile oil, coconut oil, and melatonin. 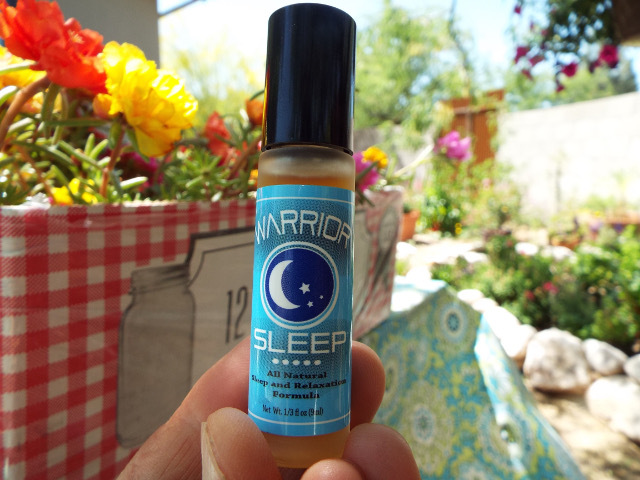 Warrior Sleep is an effective topical relaxation and sleep formula. 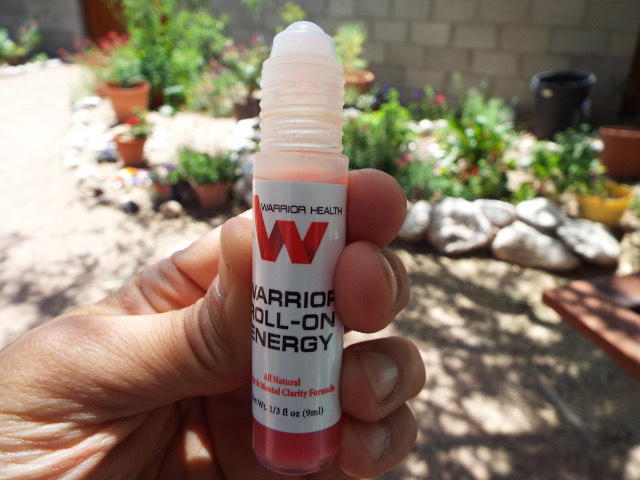 Warrior Roll-On Energy (9 ml) is a unique topical roll-on energy product. It is formulated to provide five hours of mental and physical enhancement. One bottle will last 30 days when used twice daily. Warrior Roll-On Energy contains: DMSO (99.999% pure), organic aloe vera gel (inner fillet), distilled water, organic extra virgin olive oil, peppermint oil, magnesium chloride with trace ocean minerals, MSM, organic coconut oil, caffeine (80% from green tea), soy lecithin (high phosphatide and 98% oil free), glutathione (reduced), Vitamin B6 (from pyridoxal-5’-phosphate), Vitamin B12 (as methylcobalamin), and Folinic Acid (from calcium folinate). Warrior Sleep and Warrior Roll-On Energy contain built-in roll-on applicators. I use all three Warrior products depending on daily needs. Warrior Sleep is an effective sleep aid, but is also effective for relaxation or applied before bedtime to prepare for sleep. I apply to the neck base, upper throat, and temples. We have noticed it nourishes and smooths facial skin. This is due to its synergistic blend of ingredients, including melatonin, MSM, and organic carriers oils. Warrior Roll-On Energy is uniquely energizing. It differs dramatically from most energy products, or coffee, tea, or chocolate. The formula utilizes ultra-low dose (ULD) technology to carry energizing ingredients (including caffeine from green tea) rapidly into the body. Yet, unlike caffeinated drinks, users typically experience no let down or rapid drop in energy after using it. Warrior Roll-On Energy provides non-jarring, sustained energy during the day (up to six hours). Health Care Professionals: Please contact HPDI (1-800-228-4265) to request sample(s) of Warrior Mist, Warrior Sleep, Warrior Roll-On Energy, or other products in which you are interested. Health care professionals and resellers can apply for wholesale account, which includes access to the HPDI reseller website: HealthProductsDistributors.com. Support(at)HealthProductsDistributors.com.